This coffee is roasted by Rose Park Roasters in Long Beach California, where they deliver coffee to locals on bike. 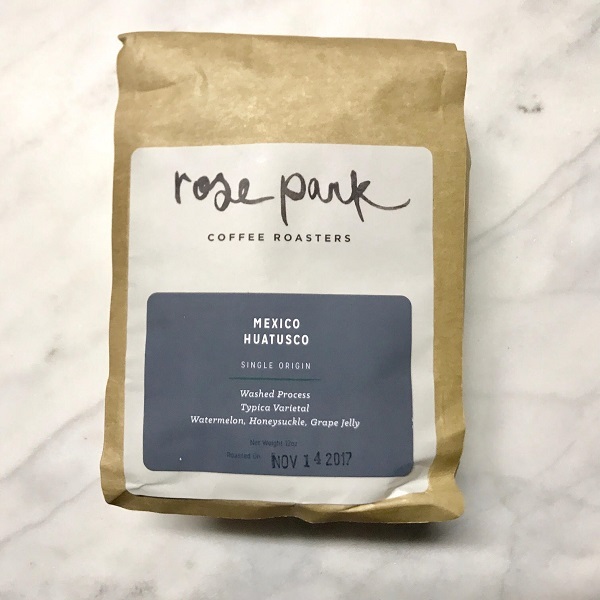 Rose Park is an artisan roaster, focused on high end coffee crops. This coffee comes from the town of Huatusco which is in mountains and due east of Mexico City in the province of Veracruz. This particular lot is actually form a group of producers known as “Coordinadora De Productores De La Zona Centro Del Estado De Veracruz”. It’s a single origin Mexican coffee, that represents the best lots you can source from the country. This particular lot is a “Cup of Excellence” auction, which is a competition and award for high quality coffees. While Mexican coffee is not abundant in the specialty coffee world, this one showcases the wine like flavors found in high quality coffee from Mexico. It’s light but fruity as an espresso, very smooth and balanced. Its flavors are more pronounced as espresso, with lots of honeysuckle and a plum to grape jelly finish. As a pour over coffee it’s smooth with a lighter flavor, making it extremely easy to drink. It’s a light to medium roast coffee, which is what Rose Park is known for. This is a great coffee, again lighter flavors of plum and berry jelly. You can easily taste the hints jelly in the finish, which is a unique characteristic of high quality Mexican coffees. This coffee ranks high in our ongoing list of the best coffees in the world for 2017.